When Michael Brown’s heart stopped, my heart broke. Suddenly, the blight in my community came into greater focus. I followed the protests, mourned in private, and repeatedly said, “I don’t know” when asked about possible solutions. I truly didn’t, and still don’t, know. I stood firm in my belief that innovation is a process to improve the human condition. I looked for ways to make incremental improvements every day within my own limited sphere of influence. I knew that there was still beauty out there and decided to revisit my planned art installation with this new perspective. I noticed a lot of people working on solutions. People wanted answers. It was like a standardized test and the Department of Justice was the proctor. My concern was that people were focusing on answers instead of questions. People wanted to find the one or two things that could lead to healing, or justice, or equity, or something meaningful. Answers indicate a person’s position, but questions illuminate a person’s perspective. I wanted more and more questions. I wanted 154 bold questions, to be precise. Framed Perspectives includes 154 Plexiglas tiles that fill the 16’ by 8’ frame. Each tile is attached to a support cable, left to swing freely as the wind blows. The physical installation is complemented by an online experience. Online I assigned a submitted question to each tile — a question that, if answered, would move St. Louis toward healing, justice, equity, or something meaningful. The 154 questions may collectively answer how St. Louis can become better tomorrow than it is today. Each question represents a perspective — a lens through which an individual views the world. There might be a blighted community on the other side of the mosaic wall, but that blight is influenced by what each person brings to the conversation. When there is turbulence and the winds shift, the swaying of a tile draws the eyes to that area of focus. You can stand in front of it and watch the movement. You can see how each tile colors what’s behind it and reflects what’s before it. You can engage. It was made to be interactive. Offline you can meditate and reflect. You can get lost in the subtle movement or watch the tiles dance in the midst of strong winds. Online you can look at all 154 questions of “In what ways can we…” and offer your insight, thoughts, and perspectives on as many as you choose. You can participate in making St. Louis better tomorrow than it is today. Framed Perspectives is my response to blight, sadness, and confusion. I did not believe healing would come in the form of an answer, but would surface as a result of better questions. This piece frames 154 perspectives. I know there are more, but let’s start with these. 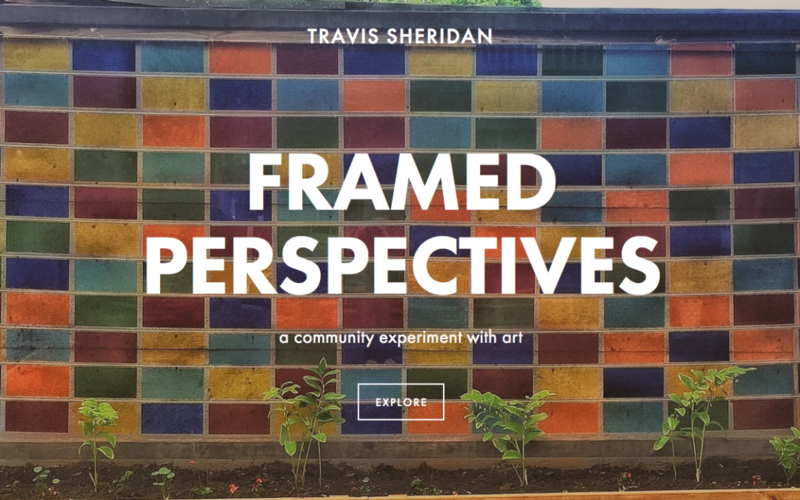 Visit the Framed Perspectives site.